Contship Italia Group participated as silver sponsor in the “Shipping, Forwarding & Logistics meet Industry”. The event was held at Assolombarda headquarters on 1st and 2nd of Feburary. Strengthening the nation’s port systems as well as inland operations is becoming crucial, to provide reliable and effective logistics service. On February 1st and 2nd, the world of shipping, freight forwarding and logistics met the Industry to discuss this hot and strategic topic. Contship participated as Silver Sponsor, maintaining its long-term commitment to sustain the Southern Gateway option, providing efficient intermodal solutions to link Italian ports and logistic hubs with the heart of Europe – offering reduced transit times that shrink inventory costs for end users. Contship Italia has a long established commitment of supporting the supply chain with port-to-door solutions. Thanks to a well-extended network, the Group is today capable of offering modern, value-added and integrated services, tailored to streamline the end-to-end supply chain, with a one-stop-shop approach. Raffaello Cioni, Contship Italia Maritime Commercial Director, participated in the panel “Intermodal and Maritime infrastructure: shifting focus from ports to the entire supply chain”. The speech highlighted the growing importance of considering the logistics systems as a whole, and emphasizing the need to broaden the industry perspective on supporting the entire port-to-door offer, through a higher specialization and a better integration of data and services. “Participating at the forum, says Raffaello Cioni, has been very stimulating, and allowed us to compare ourselves with the new trends in this complex and multifaceted world of global transport. 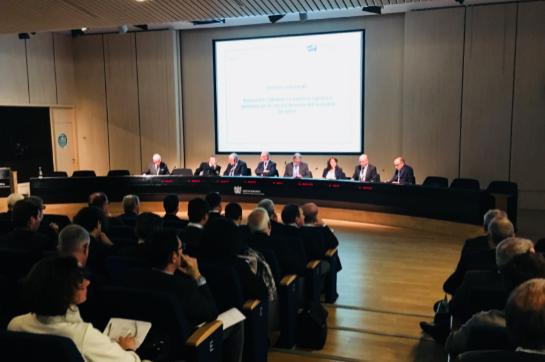 The “port-to-door” approach to the Italian and southern European markets - possible thanks to the Group’s intermodal connections and thanks the Ravenna and La Spezia gateway ports - represents Contship Italia’s effort to improve the customer supply-chain. Our founder, Angelo Ravano, launched the company in 1969 with the “We bring the ship to your factory” motto. This motto is still valid to this day, as proved by today’s conference.